We specialize in 100% authentic trend setting designer brands sunglasses and designer brands eyeglasses. At our online store you can find a wide variety of fashionable eyewear at affordable prices. We carry over 100 brands including popular designer labels such as Prada, Versace, Ray Ban and Tiffany. Our 25,000 products comprise of different styles including wayfarers and aviators. We sell widely popular and beneficial polarized sunglasses. 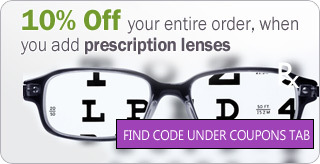 We provide prescriptions and eyeglasses repair services. For your convenience our laboratory can fill your eyeglass prescription before the frame is even shipped to you. Simply click the "Rx Add Prescription" and select your options. We offer a wide variety to fit any budget and needs. Also, we can replace any sunglasses lens and make a custom prescription lens, tinted almost any color, gradient to a degree specified and/or polarized, according to your specifications. Have a pair of glasses that are very dear to you and you would like to repair them instead of replacing? We understand, and that's why we offer our comprehensive repair services. Simply follow these steps and you will be surprised how simple and inexpensive the process is. If the frame has been damaged beyond possibility of being repaired, we have the ability to locate discontinued or hard to find models. Simply feel out the form here and we will do the research for you. We can ship to virtually any address in the world. Ground shipping within the U.S. is FREE.